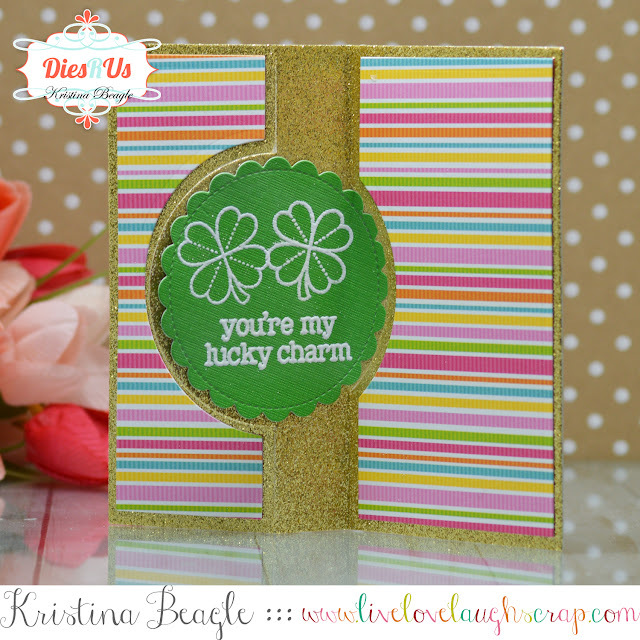 Hi Everyone, Kristina here with a fun fold / flip card for St. Patricks Day next month. 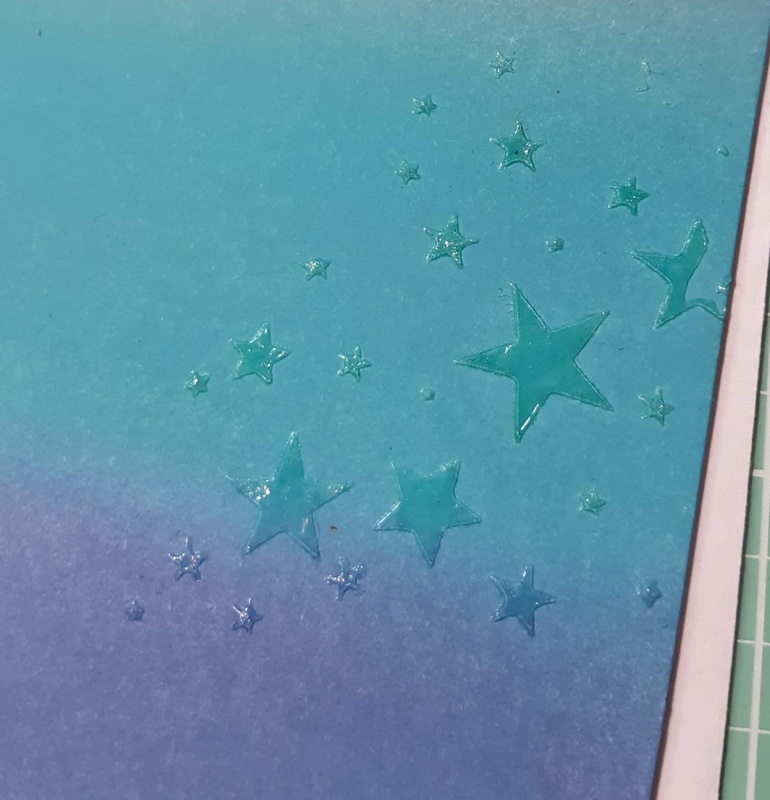 I used an older discontinued flip card die, but you can get a similar effect with something like this from frantic stamper. 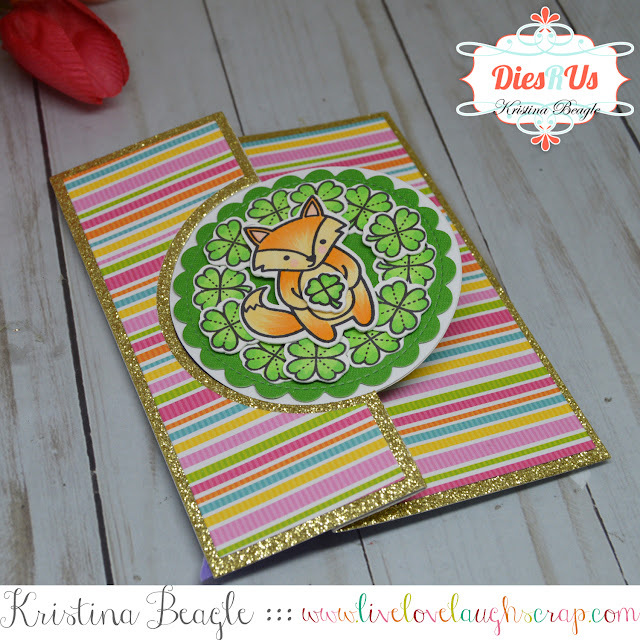 I decorated my card base with some Doodlebug paper and Lawn Fawn stamps and dies. Here's the inside. I die cut my main card panel from the die using glitter cardstock, and used the coordinating side panel dies to cut out the accent pieces from patterned paper. For the flip center, I used the Lawn Fawn Scallop Circle die to make a front and back piece for the flip circle. 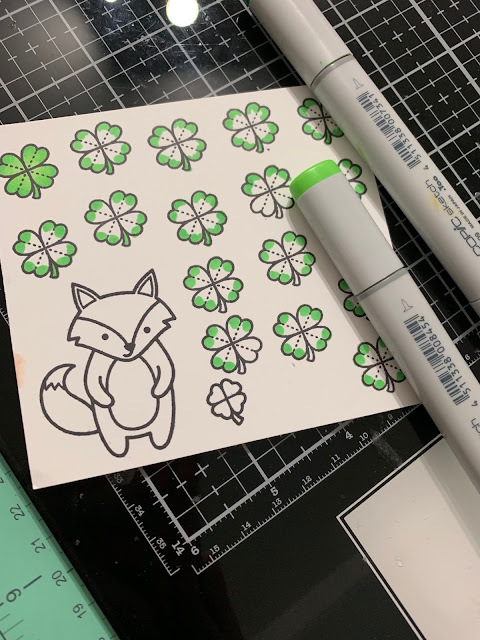 To decorate my circle, I stamped, colored, and cut out several images from the Lawn Fawn Lucky Charm and Party Animal stamp sets. I used foam squares to make a staggered wreath of four leaf clovers, and added my party animal to the middle. 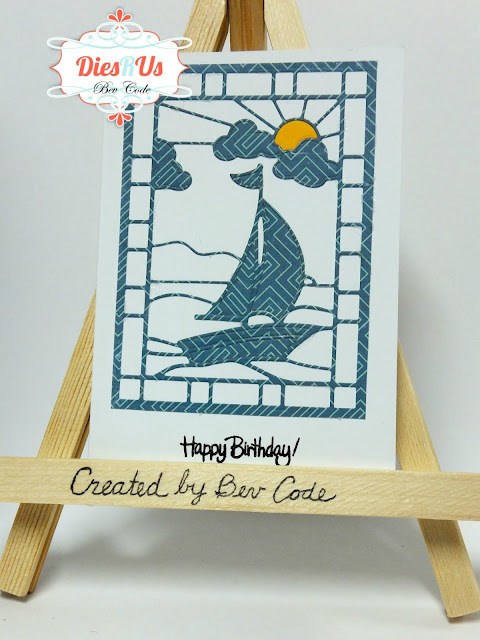 To finish the card I used some stamps from the set to stamp and heat emboss my inside sentiment. Happy Wednesday everyone! 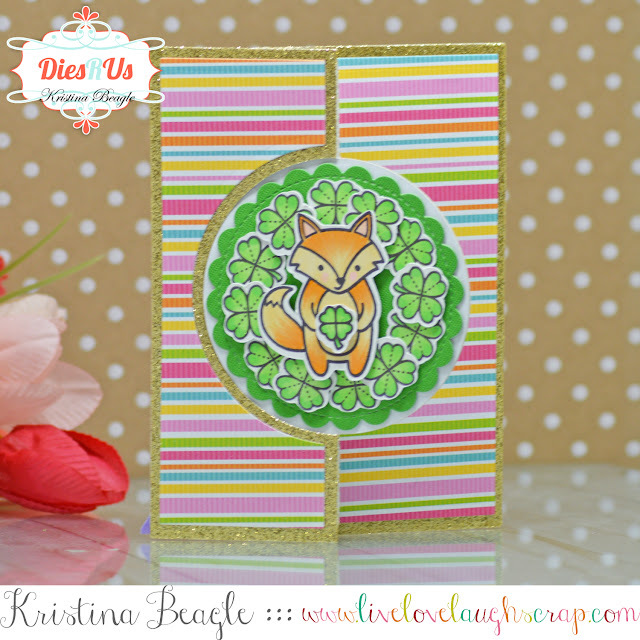 Kristina H. here with today's project share. I've got an any occasion card for you. Check out this beauty! 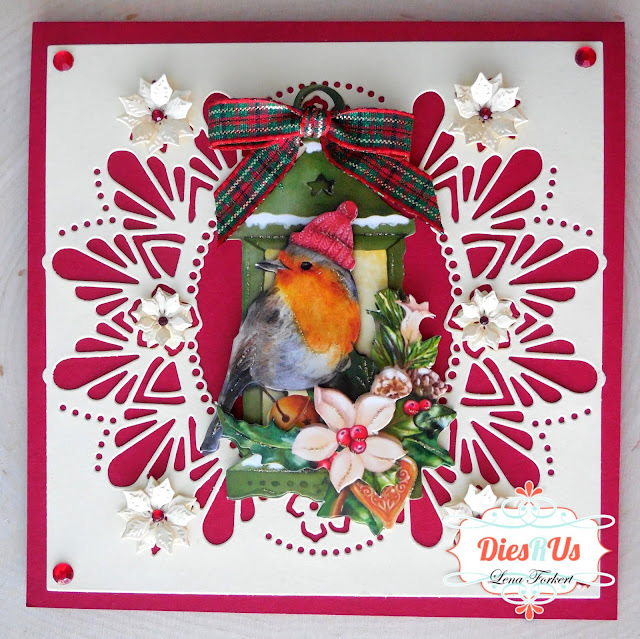 I find that when you have a gorgeous die to work with it is really easy to make a gorgeous card. Not to mention it takes minimal effort. 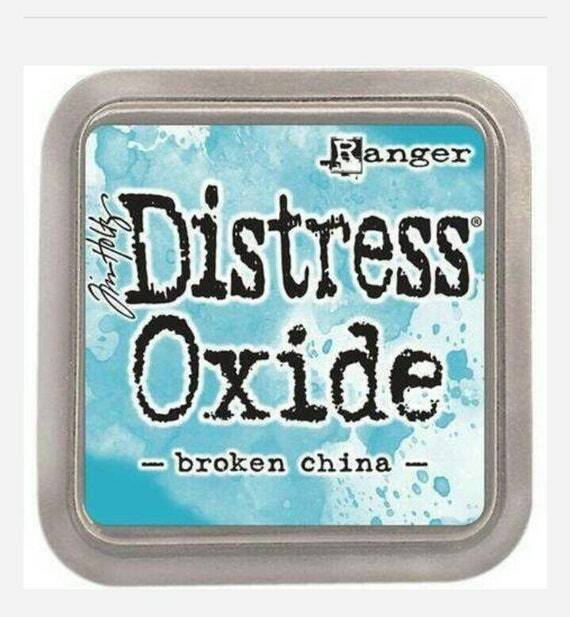 Now that's my kind of die! 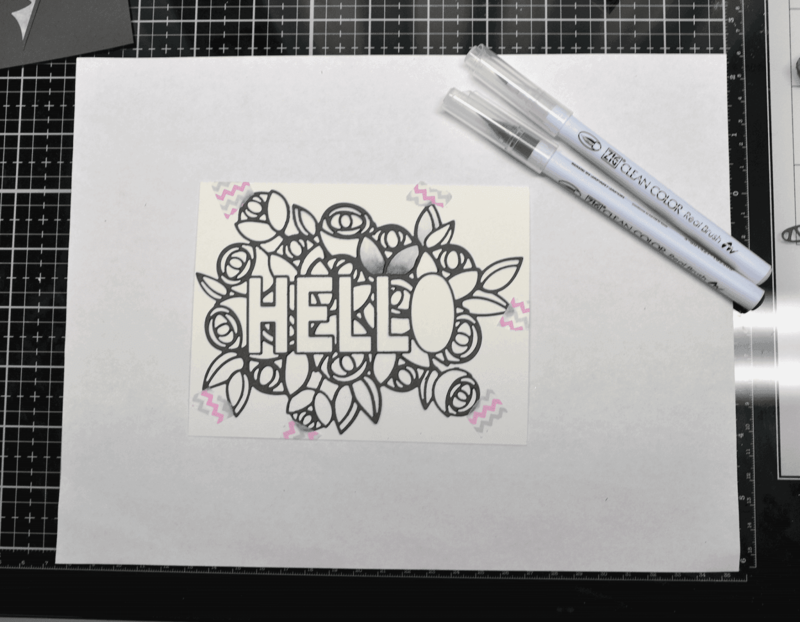 I started by grabbing a piece of dark gray cardstock. 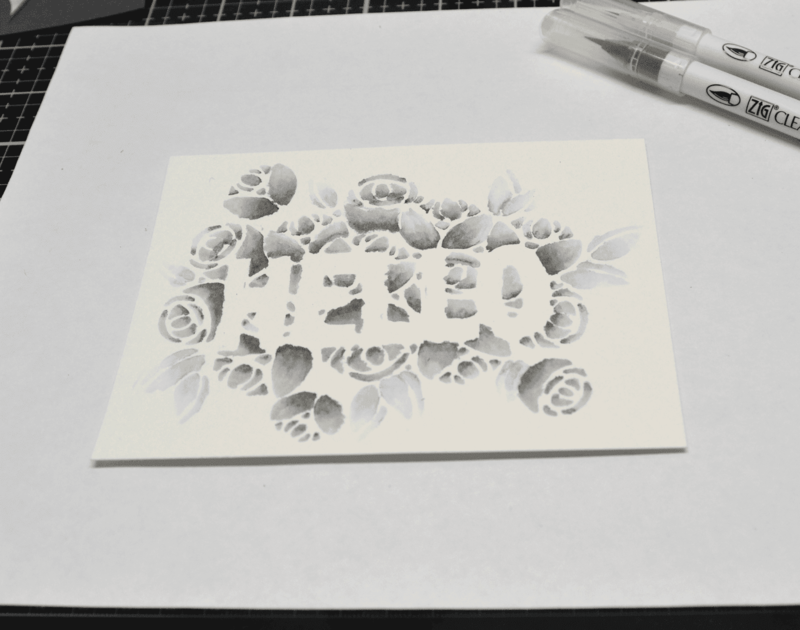 I then taped the Pinkfresh Studios Hello With a Bouquet die down and ran it through my die cut machine. Next I carefully poked out all of the pieces I didn't need. 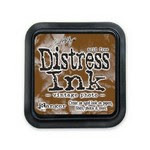 This is another die where I recommend you use your metal/detail shim in your die cut machine. Once I had all of the pieces poked out, I taped the die cut piece onto an A2 sized piece of watercolor cardstock. I taped it in several places so that it wouldn't wiggle around. I got out two different colors of Zig Clean Color Real Brush markers and my waterbrush. I went through flower by flower and leaf by leaf. I added a little of the dark gray marker to the bottom of the flower sections and spread out the color with the waterbrush. I keep a paper towel close by to scribble off my waterbrush if I feel like it still has too much color. I repeated this for all of the flowers. 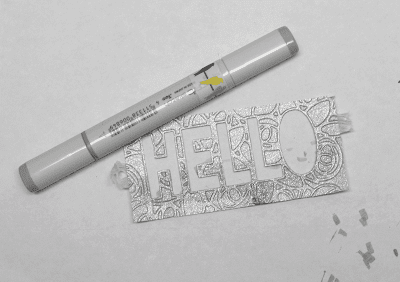 Then I used the light gray marker on all of the leaves using the same technique with the markers. Here is what it looked like after I got all of the sections colored and removed the die cut piece. 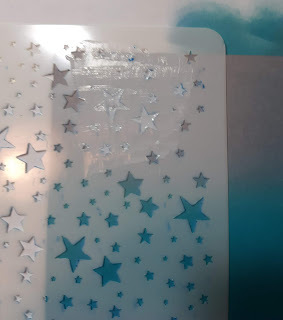 Next I cut about a 1/16th of an inch off a top and bottom of the watercolor panel. 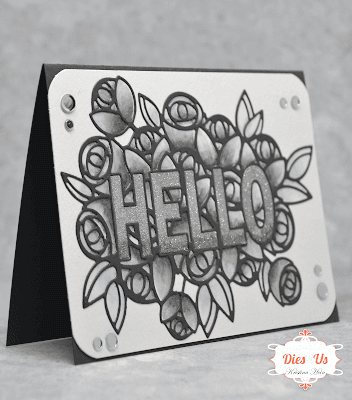 I added some Stick-it adhesive to another piece of dark gray cardstock and ran it through my die cut machine. If I had done that with my first piece I could have used it but I didn't think of it at the time. This die cut is pretty fine and would be difficult to add liquid glue to the back of. Not impossible but not exactly fun, at least for me. I peeled off the backing paper and carefully lined it up with the watercolored cardstock. I thought it looked pretty striking just like this but I wasn't done yet. 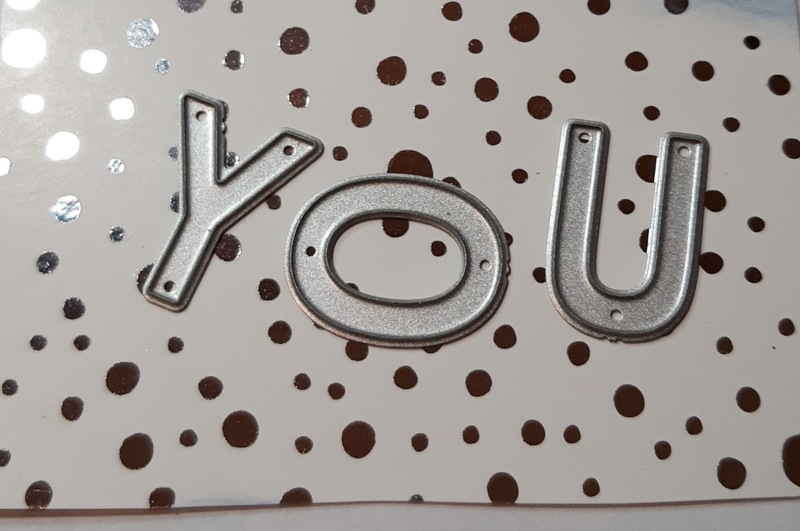 I decided I wanted to use silver glitter paper for all of the letters. 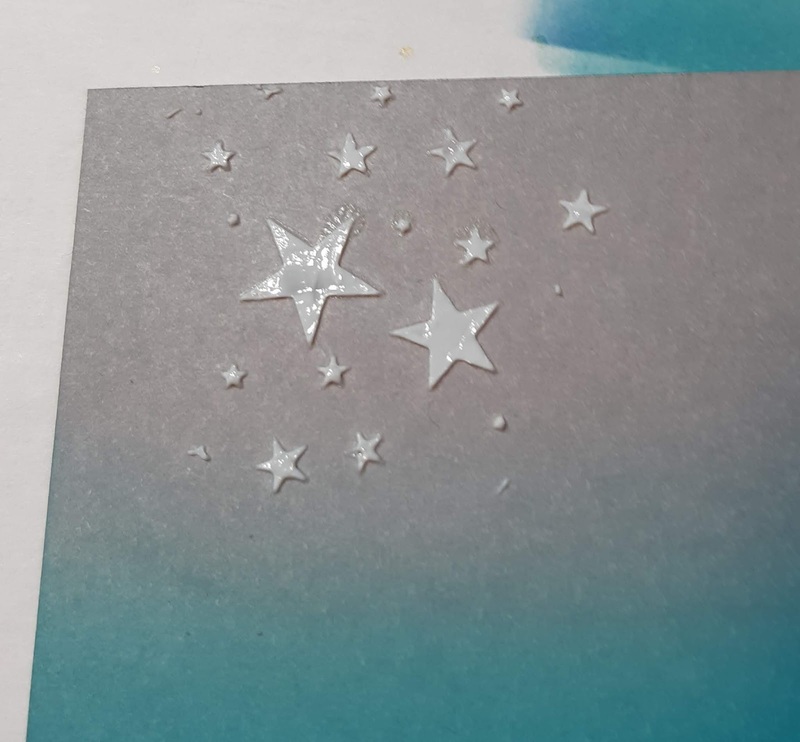 I cut a piece of glitter paper just large enough to cover the letter section of the die and ran it through the die cut machine. When I laid the glitter paper close to the colored piece I realized the silver was just too bright in comparison. Thankfully this is a pretty easy fix. I got out a T3 and T5 Copic marker. 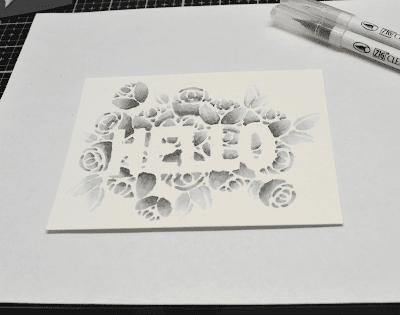 I went over all of the letters with the chisel end of the T3 marker. This toned down the brightness of the silver. I think I went over it two times. Then I added a bit of T5 to the very bottom and blended it up just a bit with the T3 until I was happy with the blend. I popped the letters out and glued them into place on the watercolor panel. Now we are pretty close to finishing up this card! 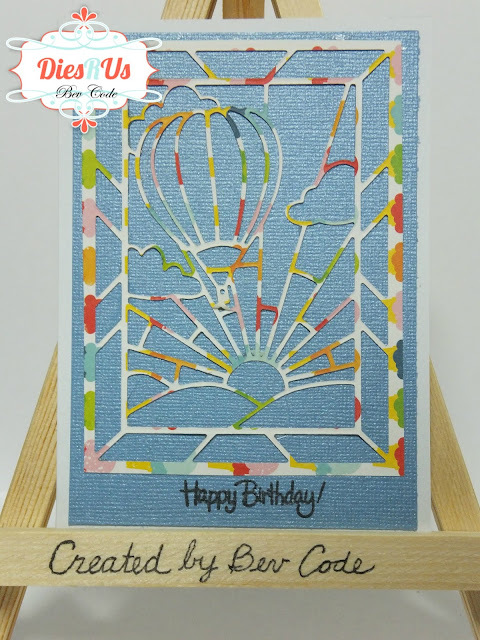 I used a corner rounder punch on all four corners of the watercolor panel. Then I glued it down to an A2 sized card base of the same dark gray cardstock I used for the die cut. 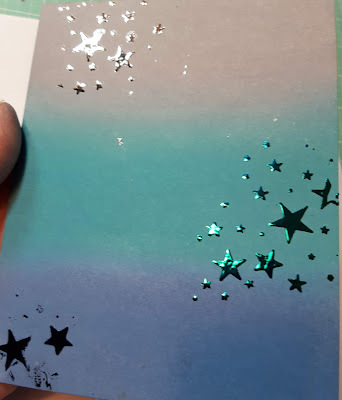 It leaves a tiny little space on the top and bottom of the card. 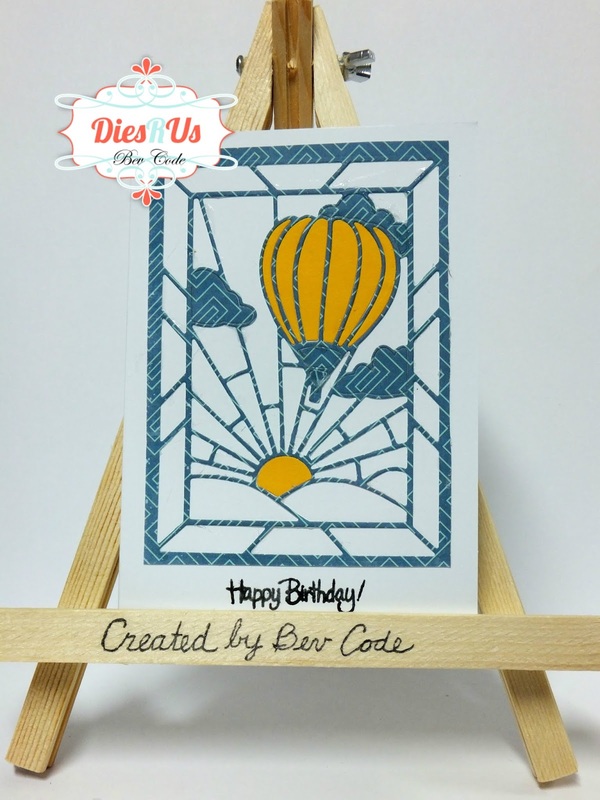 This helps to tie the base together with the die cut piece. For the final touches I glued a few confetti sequins down around the card. That's it! I know I say this all the time but I'm so pleased with how it turned out! Supplies used are listed below. 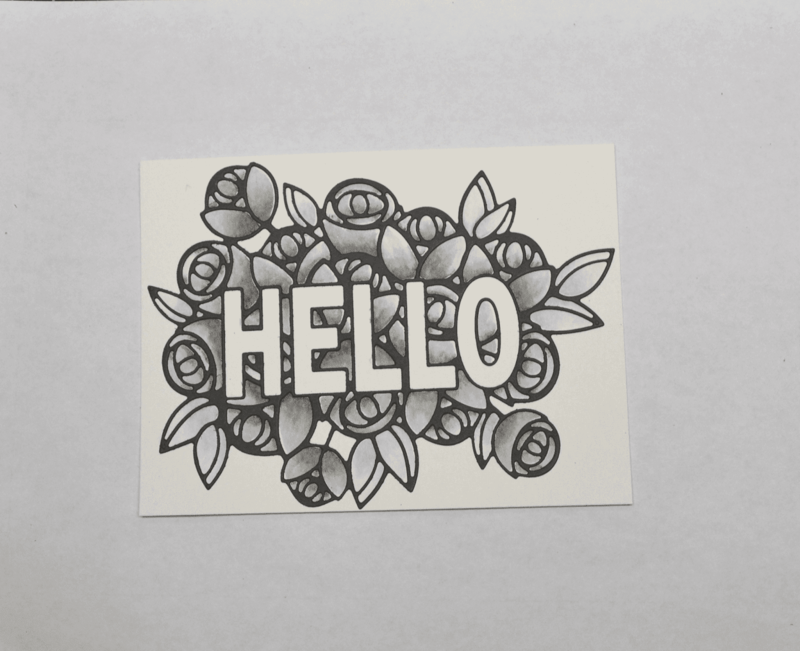 Please note, the image is not for the Pinkfresh Studios die that it I used, Hello with a Bouquet. It is currently out of stock and the link has been temporarily removed from the site. When you click on the link it will take you to all of the Pinkfresh Studios dies. Dies R Us has tons of other gorgeous dies you could use in its place to be sure! Check out all of our fabulous links below! Hi .. How are you today. 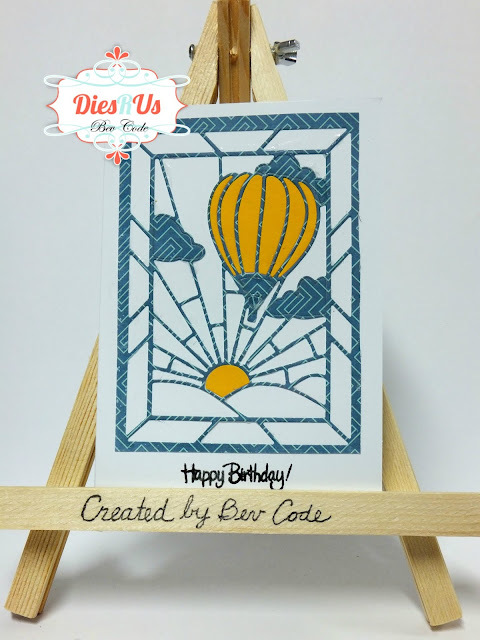 This DT project for Dies R Us showcases Birthday cards made using some die cuts along with Scraperfect Best Glue Ever with the non clog writing tip. 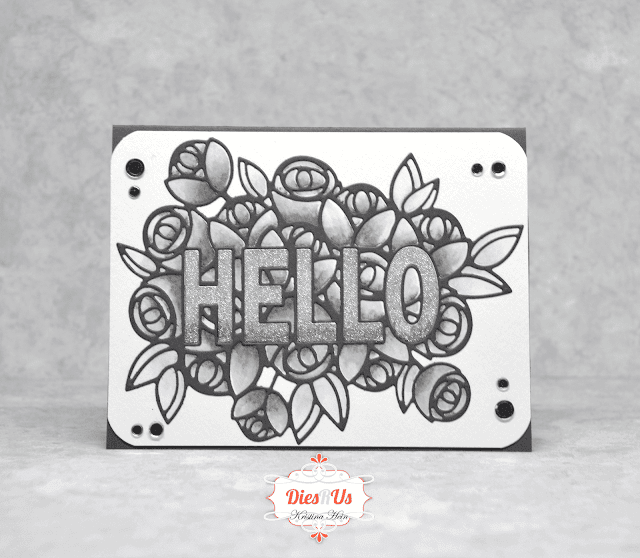 For these projects I am using the die looks like mosaics and you can use them plain or add the coloured inset pieces.. your option. After cutting the mosaic frame cut again putting some coloured paper into the section you want tosave the pieces from. Theses 2 are done like stain glass with some amazing coloured pieces inset into the frame. These 2 are more muted using just print paper to cut the image and mount on the background. All the stamping is done using a stamping platform. 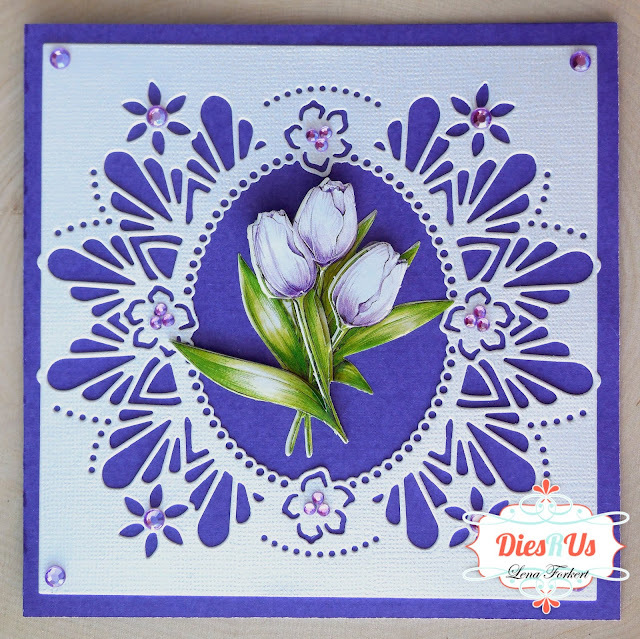 I made this card thinking of Mother's Day, but it can be used for a Birthday, a Thank You, or even a Sympathy card. The background die I'm using is the Floral Oval by Jeanine's Art's Vintage Flowers collection. I added a layered tulip image to the centre, a few gems and it was done. Didn't take me more than 15 minutes to put together this side folding 5.25" x 5.25" card. I have a special person in mind for this card. 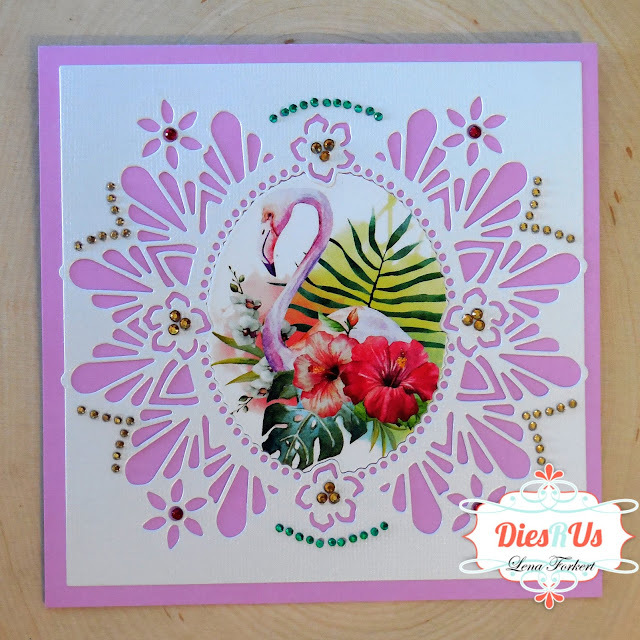 She's a very tropical and fun loving person, so this bright and cheerful card is going to make it's way to her to wish her a very Happy Birthday :-) The flamingo image is from a Tropical Birds cutting sheet by Marianne Designs. Again I added some gems and another card done in under 15 minutes :-) This is a top folding, 5.25" x 5.25" card. 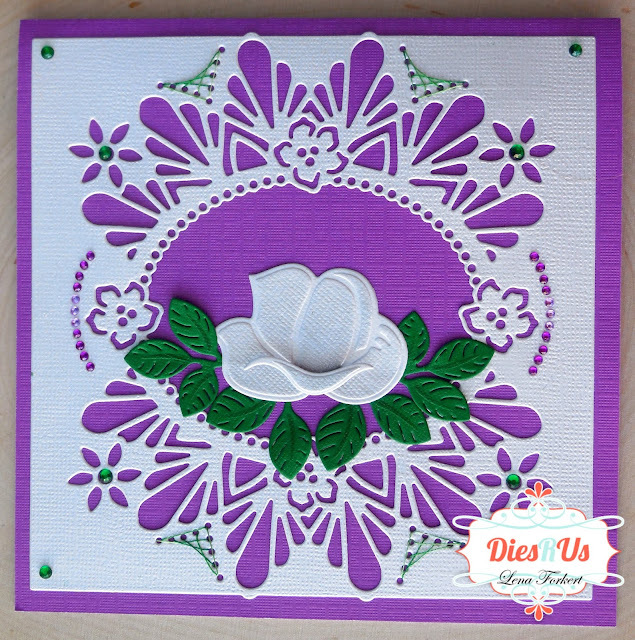 For my last card, I added a rose from Build a Rose die set by Marianne Designs, a few gems and a little stitching. 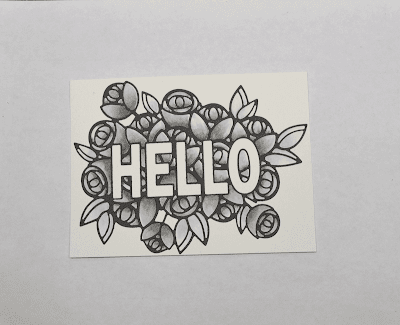 I love this rose die because you can shade it in any colour you want and it always looks pretty. For this card I used the Memento London Fog ink for the rose and the Memento Cottage Ivy for the leaves. It is better to do any sponging and shading while the die cut is still in the die. It gives your shading a sharper look. For smaller details such as the veins on the leaves, I normally a small makeup applicator to get the ink into the little spaces. 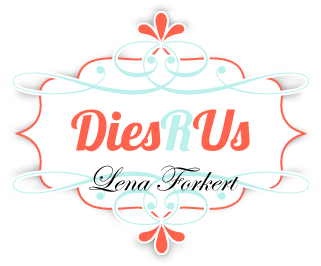 I know that I've mentioned this before, but for anyone who is visiting us for the first time, every now and then Dies R Us runs a big sale on international dies. 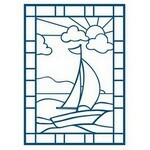 During these times, you will find dies from companies such as Marianne Designs, Lea'bilities, and Joy Crafts among others. The best way to know about these fabulous sales is to subscribe to the Dies R Us Newsletter. When you go to the store's home page, scroll down to the bottom. There you will find a box where you can enter your email address and be put on their mailing list. Well, crafting friends, that is it from me for today. 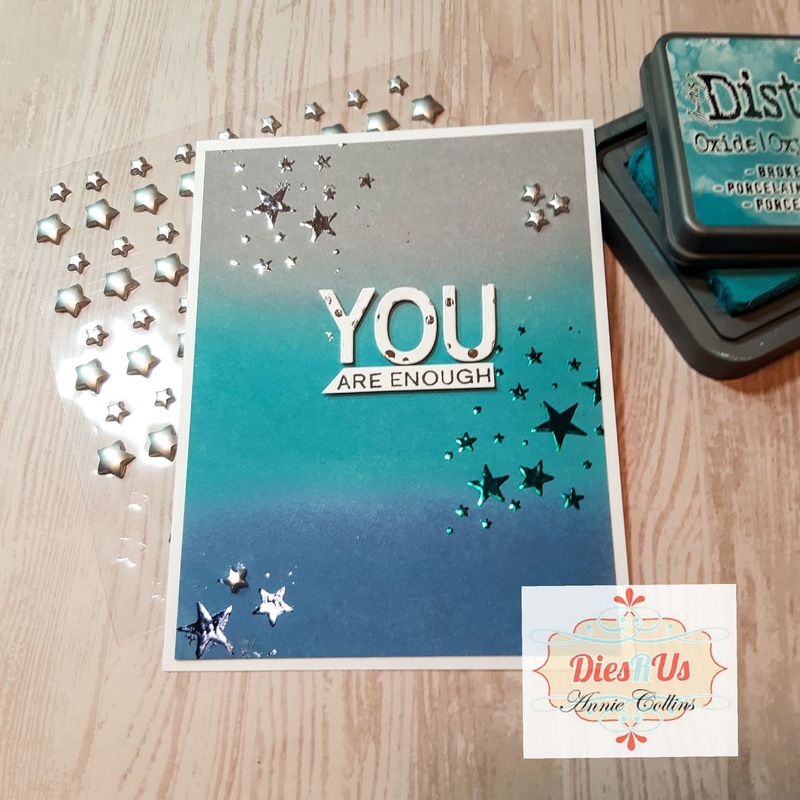 I hope you enjoyed your visit and that I was able to inspire you to use your dies, create a project, and come play along with us at the Dies R Us Challenge Blog for your chance to win a gift voucher to the Dies R Us Store. A new challenge begins on the 1st and 15th of every month. 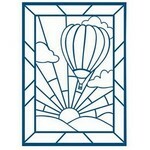 Be sure to follow us on Facebook too. 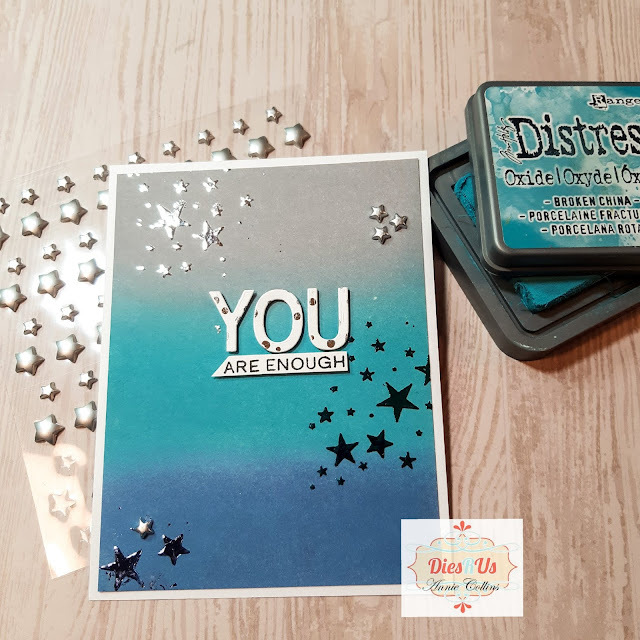 Hello Crafty Friends - Annie here with a masculine encouragement card. social media designed for the women in our lives. However, not as many for the men in our lives. Today, that's exactly what I would like to share with you. 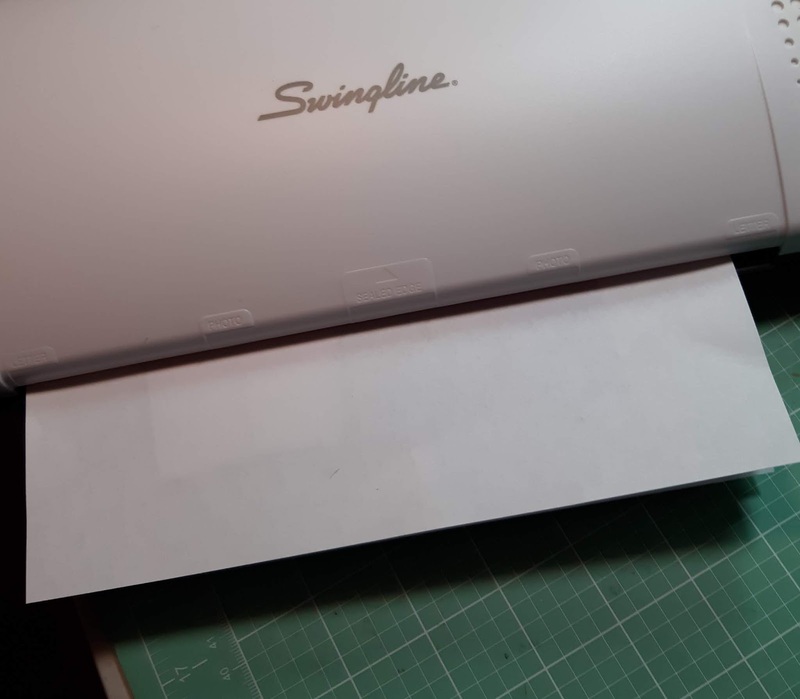 First, Turn on your laminator - so that it can get nice and hot. 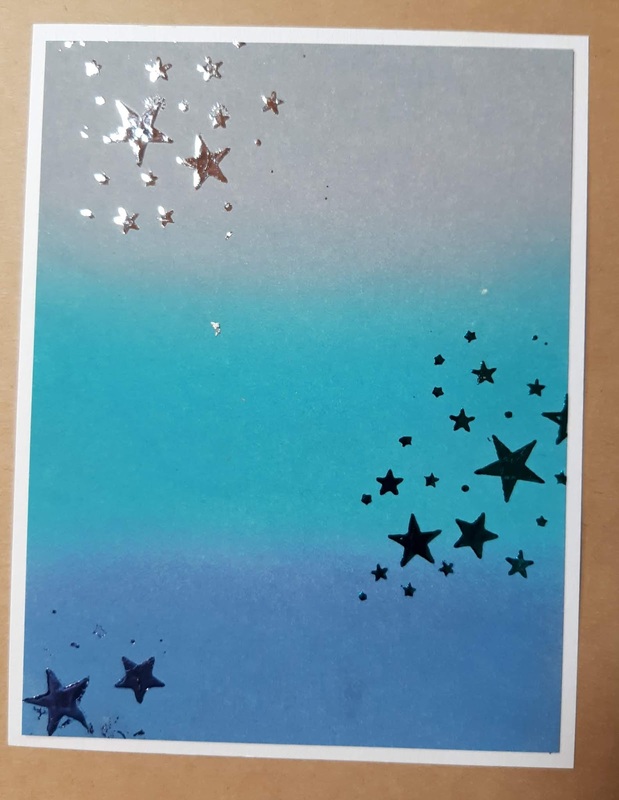 Next, on a card front panel (cut 4-1/4"X5-1/2") of Bristol Smooth cardstock, I sponged some Distress Oxide inks making sure to blend well were the colors met. 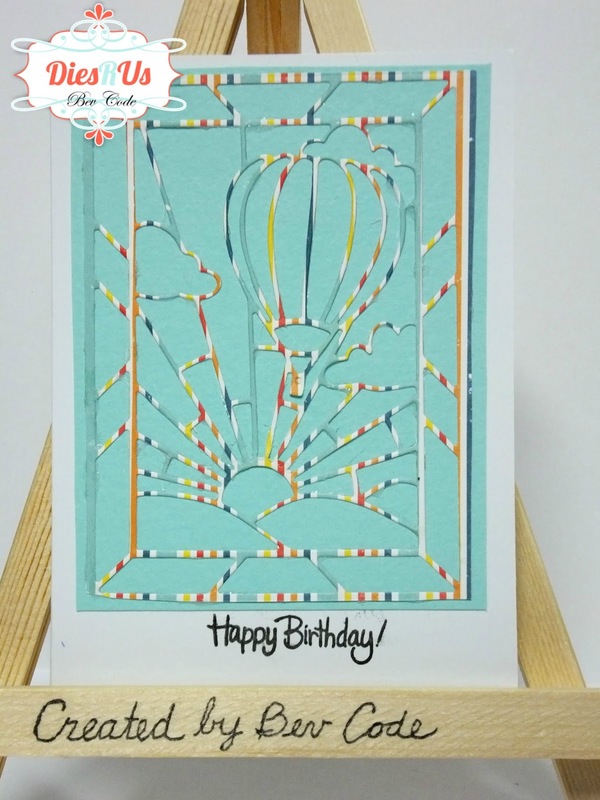 to the card front panel with a craft knife. depending on how thick it's applied. That's when it's ready to be foiled. 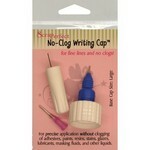 - foiled with Blade Heat Transfer Foil. 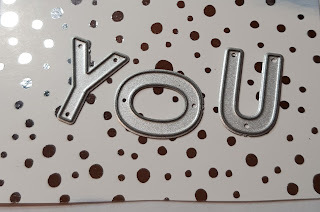 Then, stamp your secondary sentiment onto white cardstock and trim into a thin strip. send it through the laminator. 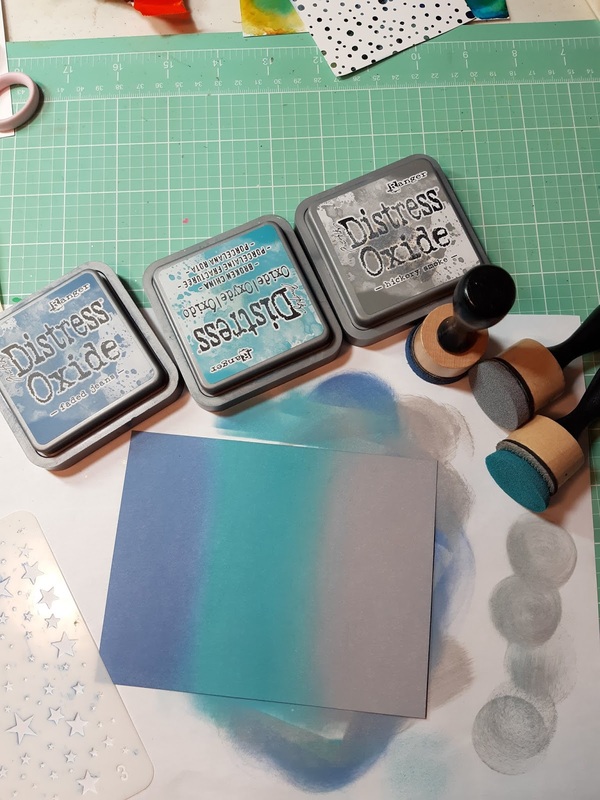 I did a tone on tone look but, you can use foil colors you prefer. 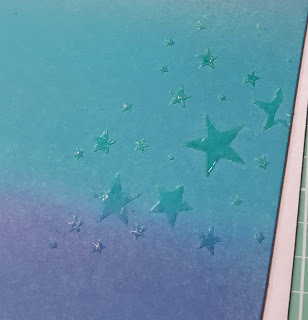 I also went a bit messy with my gel on purpose - because the person I am making this card for likes the sketch/distress look on things. You can make sure you apply your stencil nice and clean. Next, I trimmed about 1/4" off top and side of the card front and matted onto a white card base. Then, I adhered the die cut YOU and sub-sentiment to the card using low profile foam adhesive. 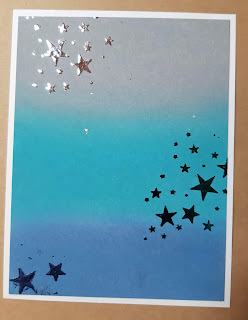 Next, I added a few dimensional silver stars and my card is complete. I hope you create a Masculine encouragement card for that special male in your life. 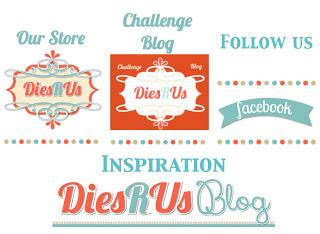 to the Dies R Us Store.